Enter basic filing information and facts about the taxpayer and student in the Taxpayer Information tab. This will help determine eligibility for the various education credit options and information needed for calculations in the Optimizer tab. If the student is receiving scholarship funds or financial help from Coverdell ESA, Qualified Tuition Plans (529 Plans), Early IRA distributions or Savings Bonds used for tuition and fees, enter the amounts in the Funding Sources tab. One input option allows you to make a part of the scholarship taxable which may increase education or other benefits and result in a higher refund (or lower amount owed). This field is also used by the Optimizer. If a dependent child student falls within the criteria to trigger a kiddie tax, the amount made taxable is limited to prevent that. Similarly, a dependent relative student&apos;s taxable income is limited to that which would no longer allow them to be a dependent. If the dependent has any income, enter it in the dependent&apos;s tax form in the Optimizer tab so that it will be taken into account for these limits. Note that "qualified expenses" for using a funding source tax-free may vary with the source and may also be different than the "qualified expenses" for tax credits which also differ depending on the credit type. Unrestricted scholarships can be used for living expenses if the student is willing to make those amounts taxable. Then enter education expenses in the Expense Information tab. The columns to the right will show what expenses qualify for the American Opportunity Credit, Lifetime Learning credit, or for Tuition and Fees adjustment. A check-mark to the left of each expense catagory indicates funds that can be used for the funding amounts in the Funding Sources tab (scholarship amounts used will be taxable). An option in the qualified expenses row, allows you to use all available funds to be spent on the qualified expenses (often results in no additional taxable income) or to use only the amount that covers expenses over that allowed for the particular credit (usually results in additional taxable income which may be offset by the use of the credit). 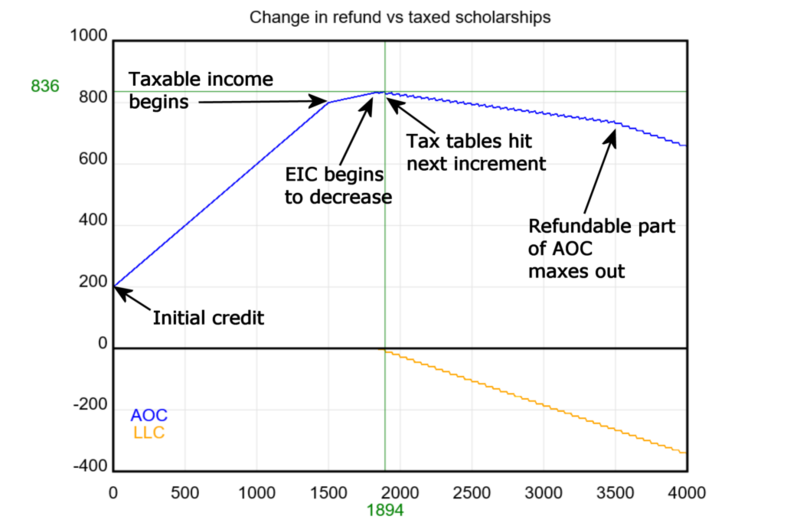 The bottom two rows show the amounts that can be used in the taxpayer&apos;s return and the amount of unused scholarship funds that are taxable. The Manual Comparison tab gives instructions on how to conduct a "what if" for each of the education options using TaxSlayer and a place to record and compare the results. Because it uses TaxSlayer to do the calculations, all the taxpayer&apos;s information is used and the calculation is the most accurate. Of course, you have to adjust the taxable amount in the Funding Sources tab manually too (ugh). The Optimizer tab takes a bit more data entry and shows a detailed comparison for each option and it&apos;s effect on various other credits. To make data entry reasonable, it must be used with TaxSlayer and does not account for all factors as the manual comparison does (that would require duplicating the entire return). Randomly changing the amounts in the entered fields may result in nonsensical results in the other columns because the fields used rely on certain TaxSlayer calculations. The results are the estimated amount of change to the taxpayer&apos;s refund (or tax owed) for each option based on the original return figures. For years prior to 2018, the optimizer prevents activating the "Kiddie Tax" due to the complexity and interactions with the parent&apos;s tax return. In 2018, that complexity was alleviated by using the Trust tax rates when the Kiddie Tax threshhold was crossed, making the calculation more straight-forward. Clicking the optimize button below the results modifies the amount of scholarship amount to be made taxable, seeking a better result. Effect of taxable amount of Social Security due to change in income and it&apos;s ripple effect with other items. In tax year 2018, George is a 25 year old taxpayer attending a school half time that qualifies for the American opportunity credit. He and his wife Sally have one child and they earned income of $22,500 for the year. George has received an unrestricted grant of $4,000, used to pay for his $4,000 tuition and $500 for books. Without optimizing, the entire grant is used to pay for the tuition, they owe no tax and they will receive a refundable $200 for AOC, $1400 for ACTC and $3,461 earned income credit. Sounds pretty good, right? After using the calculator, consider printing a copy for the taxpayer&apos;s records. The "Print all" button will print all but the Instructions. If you want that as well, print from this page. About security: Although you are entering a lot of taxpayer information in this calculator, none of that data is going to the web - it&apos;s all being calculated on your desktop, is not saved, and disappears when you exit the calculator. If you print the form, use the same care as you would if you were printing the taxpayer&apos;s return. The student is subject to the "Kiddie Tax" if the student&apos;s unearned income is greater than $ and the student is required to file a return other than to recover estimated or withheld taxes. Enter below all sources of funds, other than personal, used to pay for education expenses . Hover over each starred source to view what expenses that each source can be spent on tax-free. Early distribution of IRA funds is considered as personal funds and not included in the calculations. However, a warning message is displayed if all the funds cannot be used. Savings bond amounts are not included in the calculations because they do not affect the outcome. However, a warning message is displayed if the bond amount exeeds the education expenses (for tuition and fees) after other sources have been used. IMPORTANT: Go to the Optimizer tab and enter income information, if any, on the Student&apos;s tax return. - Amount (up to ) that you wish to make taxable for possible larger tax benefit: ? You can manually change this amount to see how the funds are distributed in the Expense Information tab. It is initially set to 0 to allow all funds to be used for qualified expenses. The entire scholarship is taxable because the student is not a degree/certification candidate. Coverdell ESA and 529 Plan funds are taxable with additional 10% penalty because the student is not at least a half-time degree/certification candidate. Enter expenses as you wish to claim them below, regardless of how the institution granting a scholarship actually used the funds. Do not include the part of the scholarship that was required to be used for non-qualifed education expenses nor the expenses covered by those funds. Tax credits are based on qualified education expenses payed for the taxpayer, spouse, or a dependent who is claimed as an exemption on the tax return. The credit is allowed for qualified education expenses paid in the current tax year for an academic period beginning in that year or in the first 3 months of the following year. Include any required computer and internet expenses in the required supplies and equipment fees category. If not required, include it in living expenses. Funding amounts in excess of allowed expenses for that type of funding (check marks below) is taxable income to the student. If the funds available exceed the limit for the tax credit, it may be advantageous to only use the amount of funds to "cover the difference" and allow the rest to be taxable and thus qualify for the tax credit. ✔ Check marks indicate expenses allowed for scholarships or other funds. Amount from funds used: ( Use maximum Cover the difference) ? Use maximum allocates all scholarship(s) available, after any designated as taxable in the funding sources tab, to qualified expenses before diverting allowed amounts to nonqualified expenses. The optimizer uses this option as it cycles through taxable amounts. Cover the difference is a single test case that diverts allowed amounts to nonqualified expenses in an amount to bring qualified expenses up to that allowed by law before allocating the remainder to qualified expenses. Due to interactions with other tax benefits, this may not be the best solution but often is. Is it worth trying to use the Optimizer tab? Perhaps. If the dependent student had any other income, you must use the Optimizer tab to enter that income to avoid any possible kiddie tax. Because expenses exceed scholarships, there is no point in optimizing however, you can still use the optimizer to view the option details Because there are no unqualified expenses, there is no point in optimizing however, you can still use the optimizer to view the option details Although there are no scholarships that can be diverted to certain nonqualified expenses, you can still use the optimizer to view the option details Expenses exceed scholarships by more than the limit for American Opportunity Credit. There is no point in optimizing if that is your best choice. Expenses exceed scholarships by more than the limit for Lifetime Learning Credit. There is no point in optimizing if that is your best choice. Expenses exceed scholarships by more than the limit for Tuition and Fees Adjustment. There is no point in optimizing if that is your best choice. Because one or both of the taxpayers is over age 65, the results of the optimizer may not be exact if there are interactions with untaxed social security benefits. This worksheet provides a place for comparing the various education options. You can also use the Optimizer tab's Worksheet although it has limitations. For additional guidance, especially for work-related education benefits, see Deb Fisher's Education Cookbook. Check the taxpayer&apos;s AGI against the credit limit table below to see for which, if any, the taxpayer qualifies. Enter the current Refund Monitor amounts in the Tax return amount column (prior to these education expenses). For each education option, enter the amounts into TaxSlayer, record the Refund Monitor amounts. Test the Tuition & Fees option first since the required school information for the others will be erased when that option is chosen. and enter the Additional taxable income of 0.
record the Refund Monitor amount and remove the above entries. Use qualified expenses of 0 for TP's tax return. enter the Additional taxable income of 0. Choose the green option, or choose none if the original amount is green. NOTE: This worksheet must be used in conjunction with TaxSlayer because it relies on TaxSlayer to do many of the calculations. Simply adjusting input numbers at random will produce nonsensical results. This worksheet will not give reliable results if the taxpayer has any of the items listed in the Instruction tab. For the first student, enter the information from the taxpayer&apos;s return before the education choice is made. If the student is a dependent, go to the student&apos;s return below and enter data from their return as well. For subsequent students, change all entries to reflect inclusion of previous students&apos; education choice(s). Estimated values for each option will then be shown in the columns on the right. Finally, click the optimize button at the bottom to see if taxing part of the scholarship gives better results. Self employed health insurance 1040 line ?? Qual Div & Cap Gn Wkt pg 1 line ?? QD&CG Wkt line ?? QBI deduction amount 1040 line ?? Form 8962 line 10A ( 12 11 10 9 8 7 6 5 4 3 2 1 months) 8962 line ?? Form 8962 line 10B 8962 line ?? Form 8962 line 10F 8962 line ?? Excess advance premium tax credit repayment 1040 line ?? Credit for child and dependent care expenses 1040 line ?? Education credits 1040 line ?? Retirement saving contribution credit 1040 line ?? Child and other dependents Tax Credit 1040 line ?? Total Nonrefundable Credits 1040 line ?? Additional Child Tax Credit 1040 line ?? Refundable american opportunity credit 1040 line ?? Net premium tax credit 1040 line ?? Pink options are poor choices. Choose the green option if there is one. this adjusts the amount taxed in the Funding Sources tab. Cannot optimize. There are no nonqualified education expenses to which scholarship funds can be diverted. Cannot optimize. There are no scholarships that can be used to pay for nonqualified expenses. Cannot optimize. The student&apos;s AGI is too high to be a qualified dependent. Cannot optimize. The student&apos;s unearned income is too high and the kiddie tax applies.